Last month, Swiftships Shipbuilders, LLC, in Morgan City, La., showcased the Anaconda-2 – an unmanned, 35-ft. craft in development – during a demonstration on the Atchafalaya River next to its HQ. The company partnered with the University of Louisiana at Lafayette more than a year ago to produce technology for a vessel that can navigate without a pilot aboard. Swiftships and ULL are designing a boat that uses Global Positioning System/sensory data, and has the potential to support naval, enforcement and zone-protection operations, mainly on inland waters. “Anaconda-2 or AN-2 is the second iteration of the original Anaconda built by Swiftships in 2001,” said Shehraze Shah, CEO, Swiftships. The diesel-powered, modified V hull form, all-aluminum Anaconda is a Swift Autonomous Vessel with twin water jet propulsions. The Anaconda can reach 50-plus knots and is designed to operate in Beaufort sea state two, or small wavelets, and can survive in sea state four – small waves with fairly frequent whitecaps. “The SAV offers enhanced surveillance and reconnaissance, identification and interception capabilities,” said Shah. “For more than eight hours at a time, it can perform force-protection duties, required by state and local authorities, coast guards and special operation commands, including the navies of the world.” The SAV uses commercial, off-the-shelf technology, making it easier for overseas clients to adopt the craft, he said. The U.S. military, meanwhile, continues to adopt unmanned technology. In 2001, Congress mandated that one-third of all ground vehicles in the U.S. Armed Forces be replaced with robotic vehicles by 2015. With an eye to that mandate, Swiftships paid attention to ULL’s success with CajunBot, an all-terrain vehicle with autonomous piloting. A ULL computer engineering team, led by professor Arun Lakhotia, developed CajunBot, and entered the six wheeler in U.S. Department of Defense contests in 2004 and 2005. 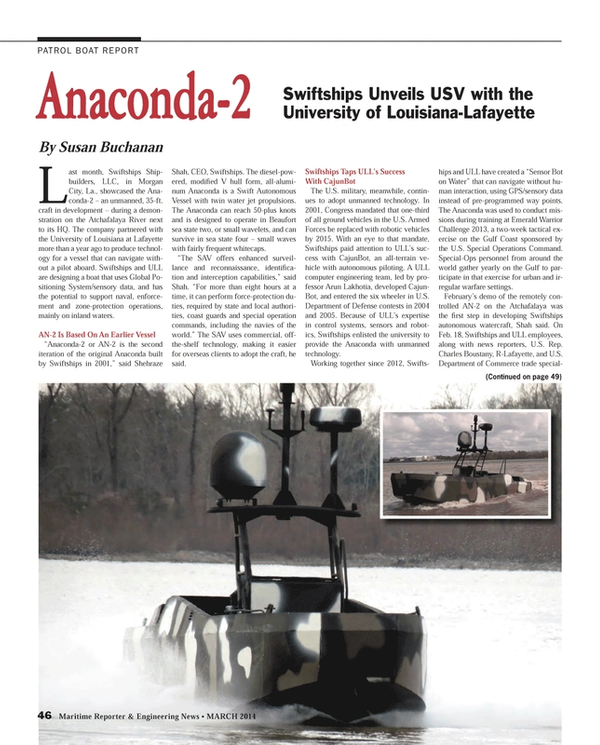 Because of ULL’s expertise in control systems, sensors and robotics, Swiftships enlisted the university to provide the Anaconda with unmanned technology. Working together since 2012, Swiftships and ULL have created a “Sensor Bot on Water” that can navigate without human interaction, using GPS/sensory data instead of pre-programmed way points. The Anaconda was used to conduct missions during training at Emerald Warrior Challenge 2013, a two-week tactical exercise on the Gulf Coast sponsored by the U.S. Special Operations Command. Special-Ops personnel from around the world gather yearly on the Gulf to participate in that exercise for urban and irregular warfare settings. February’s demo of the remotely controlled AN-2 on the Atchafalaya was the first step in developing Swiftships autonomous watercraft, Shah said. On Feb. 18, Swiftships and ULL employees, along with news reporters, U.S. Rep. Charles Boustany, R-Lafayette, and U.S. Department of Commerce trade specialist Brie Knox, boarded the AN-2 and zipped across the water. Joshua Vaughan, ULL assistant professor of mechanical engineering, piloted the vessel from his iPad. Vaughan, along with mechanical engineering grad students Nicholas Bergeron and Brett Marks, are part of the unmanned system’s development team. They’re working with lasers, cameras, ultra-sound and other sensors that gauge currents and waves to detect obstacles like logs in the water and oncoming boats. That information will flow to a computer system that steers and accelerates the AN-2, mimicking the activities of a human pilot. The first two phases are early in the project. “Complexity increases exponentially after that,” Vaughan said. “Personnel and funding will need to increase as well.” In Phase 3 and beyond, “some primary goals include extending the autonomy developed in Phase 2 to include speeds approaching the limits of the Anaconda,” Vaughan said. Researchers will work on more complex trajectories than in Phase 2 and will address obstacle avoidance and high winds. Also in Phase 3, researchers plan to extend the vessel’s remote operational distance by improving communication with the boat. They intend to refine the boat’s unmanned navigation system, using maritime and waterway standards, so that the craft recognizes buoys, signal flags and other warnings and reacts to them. Other steps in the AN-2’s development include deriving the boat’s governing equations of motion; implementing sensor processing algorithms; and software testing, Vaughan said. Shah said $100,000 is being spent on AN-2 research, with additional costs to be covered by Swiftships. Ramesh Kolluru, ULL interim vice president for research, said the public-private partnership between Swiftships and the university will produce a number of benefits. The AN-2 gives undergrads and graduate students hands-on training, and Swiftships and ULL together will train workers on the Anaconda, contributing to labor force development, he said. Eric Geibel, Swiftships special programs director, said autonomous piloting has broad implications for the marine industry and noted that the company’s vessels are always on the forefront of technology. The Anaconda can operate in air temperatures above 100 degrees Fahrenheit. With five weapons stations and a foam-filled structure, the vessel can engage in riverine warfare and remain afloat, even if it’s pierced. The craft has an advanced-design bow ramp for cargo or personnel, collapsible seating, an optional trailer and truck; and can be helicopter lifted. It’s unknown when the AN-2 will be market-ready but last year Swiftships and ULL had a three-to-five-year framework for its completion.